Filling Layer, Feather and Fiber. All fabric is removable including cushion covers. The Aragon sofa refuses to be too casual while being irresistibly comfortable. 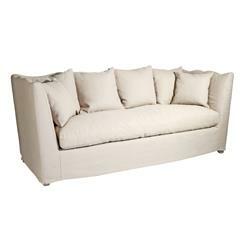 The longest and deepest in our sofa collection, its undulating curved back and sides makes a dramatic design statement. Inviting you to settle in are the high back arms and scattered feather seating and pillows, dressed up slightly from the limed gray oak feet.